Texas racing driver, team owner, and oil man, Jim Hall had become rather succesful in the Can-Am series by the time the Chaparral 2J was put on the track. 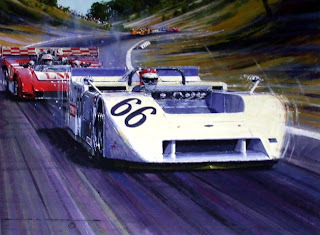 Hall and his Chaparral cars had become known for pioneering aerodynamic developments from the start and the 2J of 1970 was perhaps the most advanced - if not outlandish - of the time. The Can-Am series was a perfect test-bed for new ideas as the rules were extremely open to design variances. As Hall already knew, aerodynamic downforce was extremely important to keep a 700+ horsepower race car sticking to the track. Chaparral's previous models had sprouted wings and air-dams already though the 2J sort of "went to hell with the joke". 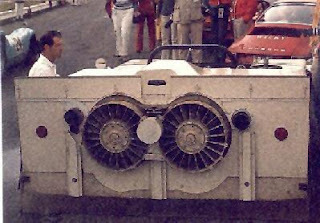 To create downforce, the 2J used a 2-stroke snowmobile engine to power two large 17 inch fans which literally sucked the car to the track. The suction was comperable to adding 1000 lbs of force to the car's tires. The car was skirted with Lexan to create a seal between the underside of the chassis and the track. The fans ran at a continuous speed, and therefore the downforce of the car remained nearly constant at all times regardless of the speed of the car. To actually drive the wheels, a Chevrolet ZL-1 Corvette V8 was mated to a three-speed semi-automatic gearbox which was essentially a manual with torque converter rather than a clutch. It was rather similar to Porsche's Sportomatic transmission. Between the massive power and the massive downforce the 2J was a remarkable force to be reckoned with. Though extremely fast, the Achilles heal of the car was reliablity. Despite this, the potential was there, particularly with Jackie Stewart behind the wheel and McLaren in particular was not pleased. 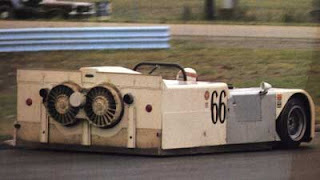 Due to complaints from that team, and others, that the car's fans kicked up debris from the track and als violated the rule banning 'movable aerodynamic devices' the SCCA outlawed the car. 1970 was the only season the car competed. To demonstrate that one can't have too many cars, here is the latest addition to my fleet, a 1985 Renault 4. It sat on the side of a neighbor's house for about six years but he never got around to doing anything with it. He is moving and I ended up with the car. It runs and drives, has a very strong motor and everything electric works. Previous owners include the French military police (Gendarmerie) which explains the dark blue and the little plugged hole on the roof where a siren used to be. My latest acquisition: A 1971 BMW 1600. This BMW was built in January of 1971 before being delivered to the BMW dealership in Fort Worth, Texas. It was acquired by a gentleman named "Mr. Johnson" of Lubbock, Texas, and it made its way through a handful of other North Texas owners before I bought it a few weeks ago. It has somewhere around 120,000 miles on the body, but the real kicker is under the hood. In place of the standard 85-horse 1.6-liter four-cylinder, it received in 1992 a bored and stroked Metric Mechanic 155-horsepower 2.2-liter four cylinder with a Weber downdraft carb. Its suspension has been lowered about half an inch (standard practice for these cars) and it rides on upgraded shocks and keeps its wheels planted via increased diameter sway bars. To deliver the power to the rear axle, it uses a four-speed short-shifter transmission. The engine has about 40,000 miles on it. The car was originally painted Nevada, a brownish gray (Google "BMW 2002 nevada" and you'll find a few pictures) and it featured a brown interior. A recent repaint gave it a color closer to BMW's common Sahara shade and it has a brand new black vinyl interior from World Upholstery. It also features dealer-installed Frigiking air conditioning. When I bought it, it had sat under a car port almost unused for three years. I've since given it a thorough scrub (shown in some of the photos), removed the fading window tint and I swapped out the pitted BMW 320i alloy wheels for a set of correct hubcaps and steel wheels (I like the look). The car is a driver, but the body is straight and essentially rust free. Only a few surface dots under some of the chrome trim reveal that it was stored under a carport for three years. It's unlikely that it has ever seen salt. To top it all off, this BMW came with a whole complement of parts, including brand new turn signals, a hood, a trunk and more. On the test drive with the 320i alloy wheels (I like the look and lighter steering feel, but I really like the steelies, plus these were pitted). Here's a car that doesn't get featured amongst these pages very often: a Citroën Traction Avant. Launched in 1934, this was the first front-wheel drive French car. While it was officially called by its engines (7, 11, 15, etc), the drivetrain layout meant that most everyone called - and calls - them Traction Avant, or front wheel drive in French. It also featured a unibody construction. Its history during WWII is rather ironic, first of all the German army used them for their own missions after France fell in 1940. What they are most remembered for, however, is as the car of choice for the French resistance, most with "FFI" (forces françaises de l'intérieur) painted on the body. Since there wasn't time after WWII to design a whole new car immediately, car manufacturers dug out what they were producing before the war, in Citroën's case the Traction, keeping the same body but with minor changes throughout the car. In 1954, some models had their rear axle equipped with Citroen's new hydraulic suspension system, a system that would be featured on all four wheels a year later on the Traction's replacement, the mythical DS. Despite its replacement, the Traction soldiered on until production finally ceased in 1957. I believe this is a 1952/1953 11B, I saw it at a body shop in a small town between Toulon and Marseille. It doesn't appear to have been registered since 1985. I spotted this late 1950s Citroën 2CV in Lourmarin, a small village north of here. I wasn't able to talk to the owner but I did speak with a villager who confirmed what the numerous bumps and dings on the body say: the owner drives it every day and has done so for quite a while. Finding an early 2CV that hasn't been restored and is still driven daily is exceptional since early models are climbing on the value scale and often get treated to a full restoration. Spotted at a used car dealership in Erie, PA was this beautifully original Mercedes 240 D.
This circa 1976 model used the 2.4L OM616 diesel engine producing 65 horsepower. This example has only 55,000 original miles, what appears to be the original paint and sports a dark blue MB-Tex interior. The fog lights are not original but are period correct units marked "Iodine"... the height of lighting technology in the 1970s. No price was given on this car, but its condition would certainly make it at the top of the scale for this model. The venerable Volvo 200 series lived on for what seemed like forever. Even today they are not uncommon to see on the road, over 30 years after its introduction. This particular example is a 1981 model year "DL". At that time, Volvo was not using the "200" series nomenclature on their cars and following this time period is when the 244, 245, 242, 264, and so-on all turned into 240s. The 200 series Volvos shared the same basic body as the 100 series which dated back to 1966. Despite being updated continuously and significantly, the design was getting a bit dated even by the 1980s. Be that as it may, the 240s and their relatives were a force to be reckoned with due to their rock-solid reliability, safety, and practicality. And so, let us take a closer look at this stalwart Swede: Our test subject is a very original 1981 DL with under 130,000 miles on it, owned by a friend and fellow motoring enthusiast. The 240 was never really known for being a 'performance' car (save for maybe the turbo versions), and the relatively low-spec "DL" was certainly no exception. This DL is powered by the "red block" B21 four cylinder engine, which is fuel injected and produces an honest 107 hp with a decent amount of torque. These powerplants are unlikely to win over the hearts of motorheads the way a DOHC Alfa-Romeo engine would, or even be admired for their uniqueness such as an air-cooled VW, however they will likely outlast just about anything else, except for perhaps a diesel Mercedes. The engine drives the rear wheels with a 4-speed manual with (get ready) electronic overdrive! - which was still somewhat of a novel idea in 1980. Pulling away in first gear with the typically heavy Volvo clutch is a rather unexciting affair. The revs build quickly, and when it seems like enough (there is no tachometer in the DL), you can shift to 2nd. This is when the car actually shows some real acceleration. Through the gears to 4th, the Volvo is actually fairly swift, and once a comfortable cruising speed is reached, the overdrive button can be pushed and the engine settles down to a nice low rumble. Gear changes are easy and fairly precise though sometimes a tad notchy. Riding on the highway at around 50mph, the Volvo cruises along with traffic comfortably, though any burst of acceleration involves disengaging overdrive. The ride is a tad 'floaty' compared to some European sedans, but the handling is actually rather crisp and the steering nicely responsive. The brakes are quite good for a car of this vintage, having discs on all four wheels. There is some noticeable body roll, but not enough to be all that scary around a brisk turn once you've gotten used to it. What is most unexpected is how much you can actually find yourself enjoying driving this car. Inside, the car is rather narrow, but still roomy and quite enough for four adults to be comfortable. On this DL spec car, amenities are limited though. Windows are manual, air conditioning is non-existent, and the heating/ventilation system is best described as basic - tough perfectly effective. As is common with the 240 Volvos, there are ample amounts of hard plastic and vinyl. Gauges and controls are basic, easy to read, and get the job done without much fuss. The truck building heritage of Volvo is evident in this car. It's basic, solid, and reliable. It's a no frills transportation machine, though quite enjoyable to drive. As a mechanic, I've always appreciated the construction and ease of maintenance on these old Swedish bricks, and now, having spent some real time behind the wheel of this one, I genuinely appreciate driving them. To quote the movie Crazy People, "Buy Volvos...they're boxy, but they're good." Road test: 2009 Alfa MiTo. Based on Fiat’s Grande Punto platform and designed with the exotic Alfa Romeo 8C in mind, the Alfa Romeo MiTo (for Milano and Torino) is the firm’s answer to the Mini. Only available only in a three-door, it’s also the first in a two-part replacement of the aging 147: a new five-door only car rumored to be badged Milano will be introduced in the next few years and the 147 will be phased out at that time. I recently had a chance to sample a gasoline-powered 120hp 1.4 T-jet MiTo equipped with a 6-speed manual transmission. When I first drove off in the car I was anything but impressed – it seemed slower than my daily driver 1997 Fiat Brava, 200cc bigger but also heavier. I was expecting it to be much faster and briefly wondered if I mistakenly hadn’t released the hand brake all the way. Once I got the rpms up it picked up a bit but as soon as I hit a roundabout and had to build up speed again I found myself cursing the acceleration. However, this lack of performance changes thanks to the so called “DNA system” that is already in use on the Fiat-Abarth 500. A little above and left of the gearshift sits a switch that allows the driver to select between three settings: “Dynamic”, "Normal" and "All Weather". Going from “Normal” to “Dynamic” turns the MiTo into a completely different car – it becomes noticeably faster and more responsive, the steering becomes tighter and the braking becomes more effective; with a simple flip of a switch the car is enjoyable and drives like a proper Alfa. In the aforementioned mode the engine seems to beg you to take the rpms higher and higher as it delivers its full cavalry of 120 horses. Switching modes also makes for tighter steering and more effective braking, making the MiTo a real joy on twisty backcountry roads. Alfa’s active suspension shines on tight corners and the car makes you feel as if you’re in total control of it at any given moment. The ESP (standard on all MiTos) is there to help you out if this feeling turns into an illusion. It’s not the go-kart that the Mini is but one has to keep in mind it wasn’t designed to be; it was designed with Alfa’s heritage in mind, not Mini’s, and it’s just as enjoyable to drive as its competitor but in a different way, the Mini being a tad more on the sport side and the Alfa being just a little more on the touring side. The downside to this mode is the fuel consumption (around 8 litres/100 kilometres normally) rises. It is worth noting that the MiTo is available with Alfa’s proven JTD common-rail diesel engine for customers concerned with fuel economy. The “Normal” mode is more for casual around town driving with optimized economy and safety. The steering is looser to aid in parking and tight maneuvers, the suspension is a bit softer to give a more comfortable ride and, as mentioned above, the car is less responsive. The “All Weather” mode is for driving in adverse weather condition and provides more safety and grip on slippery roads by stepping up the ESP, amongst other features. It seems Alfa has learned some valuable lessons in ergonomics in the last twenty years and all the controls are logically placed on the dashboard. Keeping true to the car’s overall design theme, the latter looks like a minimized version of the 8C’s dash. I especially appreciate the use of real gauges for the instrument cluster made up of a speedometer, tachometer, fuel gauge and temperature bath, all functions that find themselves increasingly replaced by analog units. The equipment level is average and includes electric windows, ESP and manual air conditioning are standard on all trim levels. The list of options is rather large and can easily add thousands of Euros to the price. Available options include bigger rims (16”s come standard), a sunroof, an automated air conditioning system and some high tech gadgets such as an iPod plug-in and a way to connect your Bluetooth-equipped mobile phone. An interesting option is the ability to order either a 4-seater or a 5-seater. With the 4-seater the MiTo turns into a 2+2 of sorts, four adults can comfortably fit in the car. The rear seats fold down as a whole in this configuration. In the 5-seater configuration, the rear seats fold down in a 40/60 manner and Alfa claims you can seat five adults back there but you can’t guarantee comfort for the guy who takes the middle seat. Trunk space remains the same in both configurations and is adequate for a car that size, the only problem with it being that the load level is too high and makes loading bulky objects tricky. Rear visibility isn’t fantastic due to the thickness of the C pillars. Alfa paid attention to the safety of this car and numerous airbags are available, including one designed to protect the driver’s knees in the case of a crash. As a result, the MiTo scored five stars on the Euro NCAP crash test, making it one of the safest cars in its category, and it received a 3.35 out of 4.00 in a new test that determines how well the front seats prevent whiplash. A downside is that despite the efforts put forth by Alfa, the build quality isn’t up to par yet. For example, the pull-out storage compartment on the left side of the dash was broken and the car only had a few hundred kilometers on it. It does feel much more solid than the Alfas of ten years ago, the effort put into making better-built cars is noticeable. Starting at 15,000 Euros for a base 78hp 1.4 model without options, the MiTo is a good deal if you can do without a lot of the superfluous options (GPS, leather wrapped gearshift, back up radar, etc). If you want a loaded one, plan on making your wallet considerably lighter.